Workers processed fish at Great Eastern Seafood in the Boston Food Market. The growing cluster of seafood processing firms in South Boston serves both local and nationwide businesses. THERE IS A REASON a cod hangs in the State House as our official emblem. For almost as long as there has been a port in Boston, seafood has been a part of it. Seafood is linked to our regional identity, it is embedded in New England’s food system, and it needs to be — and can be — part of our economic future. But it should not be taken for granted. The metropolitan area’s neighborhoods are, in many ways, known by their industries. Longwood equals medicine. Kendall Square is high tech. South Boston’s waterfront has become an innovation center. But few know it’s also home to innovative ways to process seafood. Long before the biotech firms, cool restaurants, and law firms made a home there, seafood companies were doing business in that part of town. It is important that there be room for the industry going forward. Massachusetts ranks second to Alaska in the value of seafood caught nationally. Several of the state’s ports — especially New Bedford and Gloucester — bring in bigger catches than Boston. But Boston has the rare ingredients that position it as an epicenter of the state’s seafood processing industry. In close proximity, it has dockside access to fishing boats and seafood processors, an international airport, the interstate highway system, and a global shipping container facility. There are 58 seafood businesses within a 1.25 mile radius of South Boston. The 101-year-old Boston Fish Pier is still home to the city’s working fishing fleet, and its catch has grown by 80 percent in recent years, with 20 million pounds landed in 2013 despite federal policy restrictions. A mix of new tenants and longstanding businesses is bringing renewed energy to the Fish Pier. Two years ago, 67 percent of the processing spaces were occupied. Today, 94 percent of space is filled. Twenty-one fishing boats have berthing spots at the Fish Pier, another six are on a waiting list. While South Boston’s Seaport District has undergone remarkable change in the last 40 years, so too has the seafood processing industry centered there. But it has done so with little notice while grappling with enormous challenges — including a relentless decline in the stock of fresh Atlantic groundfish during the 1980s and 1990s, according to federal reports. Today, processors are leveraging new technologies and relying on a global network of imports and exports by air and sea. There is more focus than ever on letting consumers know when and where fish was caught. That’s important because people increasingly prefer fresh over frozen fish. The growing cluster of seafood processing firms in South Boston doesn’t just serve local restaurants, markets, and supermarkets where you get fresh salmon and swordfish — it does the same for restaurants around the nation. Chances are good the swordfish you eat at a steak restaurant in Chicago was cleaned, filleted, weighed, and cut on Drydock Avenue in South Boston. To make this possible, quick access from boat to processing facility is especially critical. For example, fish flown in to Logan from fishing hubs like Iceland is trucked to South Boston. 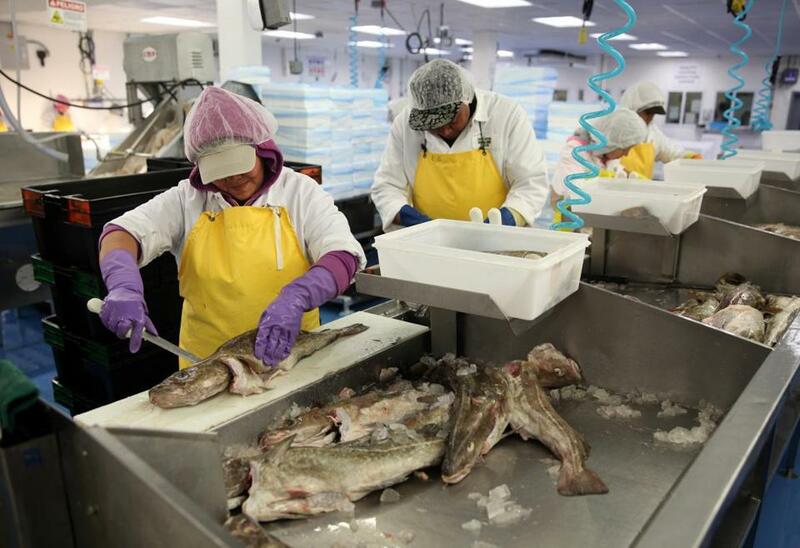 Once the fish is unloaded, skilled workers clean and debone it into fillets inside facilities where temperatures hover in the 30s year-round. The fish travels on specialized conveyor belts to be weighed and then sliced by lasers, turning a five-pound fillet into 13 six-ounce portions in seconds. The portion sizes are packaged and sent back to the airport to be flown around the country. Clearly, seafood processing is a growth industry in Boston. The 1,400 jobs in seafood processing represent about 20 percent of the port’s total of 7,000. Employers range in size and scale — from Fish Pier businesses like new entrant Red’s Best and third generation stalwarts like Atlantic Coast Seafood to large national and global operations like Legal Sea Foods and North Coast Seafoods. The seafood industry still faces challenges. Nationally, consumption of seafood is flat, even though the health benefits are well known. Catch quotas designed to protect the industry are making it harder than ever for men and women who take to the sea to earn a living. And consumers haven’t exactly embraced the promotion of plentiful species such as monkfish and razor clams. But it’s not as though people don’t like eating seafood — the fourth annual Seafood Festival, held on the Fish Pier earlier this month, attracted a large crowd of over 10,000. Massport is committed to industry growth by making sure there is room in the Seaport District for new processors and expanded seafood businesses, and the blue-collar jobs they bring. You can put a law firm anywhere, but seafood needs a working port. Thomas Glynn is chief executive of the Massachusetts Port Authority.